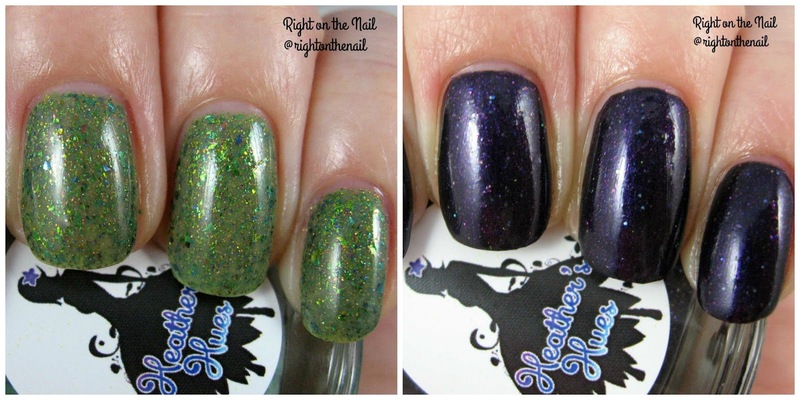 Up next is Love Song #9 which is a black jelly with lots of purple holo microglitter and some multichrome flakes. It also happens to be named after a fun song! How beautiful is this one?! Even though it's a jelly, it still only needed 2 easy coats. Overall, I was really impressed with the formula and application of the polishes from Heather's Hues. Love Song #9 is only $5, and it's still on sale if you're interested in purchasing it. Heather also just released a new collection inspired by the county fair. Oh man, I just love the fair so count me me! You can find out about Heather's Hues on their Etsy site, Instagram, and Facebook pages. I just found out that they also have a Facebook group which is called Heather's Hue-t-pies (just search for it in Facebook). You have to be approved, but it shouldn't take long.